Home > Food Facts > How Many Calories in a Boiled Egg? Are Hard Boiled Eggs Good for You? 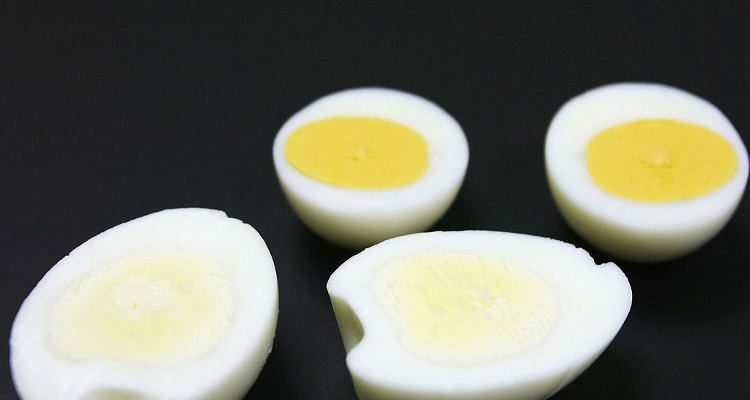 How Many Calories in a Boiled Egg? Are Hard Boiled Eggs Good for You? Are hard boiled eggs good for you? Absolutely: hard boiled eggs are 100% good for you. They are an excellent choice for breakfast with a piece of organic whole-wheat toast and some fruit or an avocado. The protein in the eggs will keep you full for hours until lunch and keep you from snacking, which can help curb weight gain and extra caloric intake. The number of calories in a boiled egg aren’t that high and when the protein value and other minerals and vitamins are taken into consideration, it doesn’t matter how many calories there are. The body needs calories to function; they are the fuel that keeps us going. And calories in boiled eggs are a clean, reliable source of energy. Where our calories come from matters as much, if not more, than how many we might consume. Eggs have gotten a bad rap the past 20 years and for no good reason, really. Many people wonder about how many calories are in a boiled egg because we are a very calorie-aware society. Generally, if you don’t need to lose weight and eat healthy food that is clean and not processed, counting calories is not required. On average, men need about 2,500 calories per day and women about 2,000 calories if the goal is to maintain weight. This goes down a bit if weight loss is desired. Daily levels of cholesterol in healthy people should not exceed 300 mg. There have been some studies showing that the cholesterol in an egg is possibly a good kind of cholesterol. For all the protein and vitamins (especially A and B12) they contain, a couple of eggs a day are well worth it. The Harvard T.H. Chan School of Public Health suggests limiting the number of egg yolks eaten in a week to no more than three if a person suffers from diabetes or heart disease. Research is now showing that eggs aren’t the evil food they have been made out to be. It isn’t the cholesterol in eggs that is bad for us, but the saturated fat. Eggs are an extremely healthy food to add to most diets. But be sure to follow your doctor’s orders if you’ve been told to limit or avoid them. Otherwise, up to three eggs can safely be eaten every day. Their protein values are incredible and will keep the body full for hours. Hard boiled eggs are a clean alternative to, say, fried eggs or an omelet because you are avoiding the use of any extra fat when cooking. However, that being said, the body needs healthy fats such as butter and good-quality olive oil to function. And hard boiled eggs are easy to make and carry around for a quick snack. Boil a dozen on Sunday and have them on hand for the family to grab. Slice them in half and season with some salt and pepper. How to make a hard boiled egg is actually quite simple. If you overcook them, the yolks might be grey, but the eggs will still be edible. But to get the very best hard boiled eggs, this is what you do. Place your eggs in cold water in a pot. Bring the pot to a boil on the stove on high heat. Make sure to salt the water. This is an important step to perfect boiled eggs. When the water comes to a boil, remove the pot from the stove and cover it right away. Keep it covered for 13 minutes (the perfect boiled egg time), and then drain the hot water and add cold water to cool the eggs down. Peel and enjoy! How To Check If Eggs Are Bad?